Posted on 4, November 2016 by EuropaWire PR Editors | This entry was posted in Government, Investment, Politics, Society, United Kingdom and tagged Fionnuala Jay-O’Boyle OBE, Her Majesty The Queen, James Brokenshire, Juan Manuel Santos de Calderon, Northern Ireland, peace-building, UK government funding, UK-Colombia partnership. Bookmark the permalink. LONDON, 04-Nov-2016 — /EuropaWire/ — New UK government funding for a UK-Colombia strategic partnership to share expertise on peace-building was confirmed today by Secretary of State for Northern Ireland James Brokenshire as he officially welcomed the President of Colombia, Juan Manuel Santos de Calderon, to Belfast. The partnership between Northern Ireland Co-operation Overseas (NI-CO) and the Colombian governments will focus on education and policing reform and strengthening existing links between Northern Ireland and Colombia. The partnership was confirmed as President Santos touched down in Belfast for the final part of a three-day programme as a guest of Her Majesty the Queen. It is Colombia’s first state visit to the UK. It is a privilege formally to welcome President Santos to Northern Ireland. His state visit is a valuable opportunity to strengthen political, cultural and commercial ties between Colombia and Northern Ireland and the wider UK. I also found it particularly valuable to share perspectives on recent experience during our meeting at Stormont House this afternoon. There are few greater responsibilities for government than helping to build a peaceful, stable and prosperous society. President Santos’ efforts to end the five-decade civil war in Colombia are testimony both to his leadership and to his commitment to that vision. The NI-CO strategic partnership demonstrates enduring UK government and Northern Ireland support for a final and long-lasting peace agreement for Colombia and a brighter future. 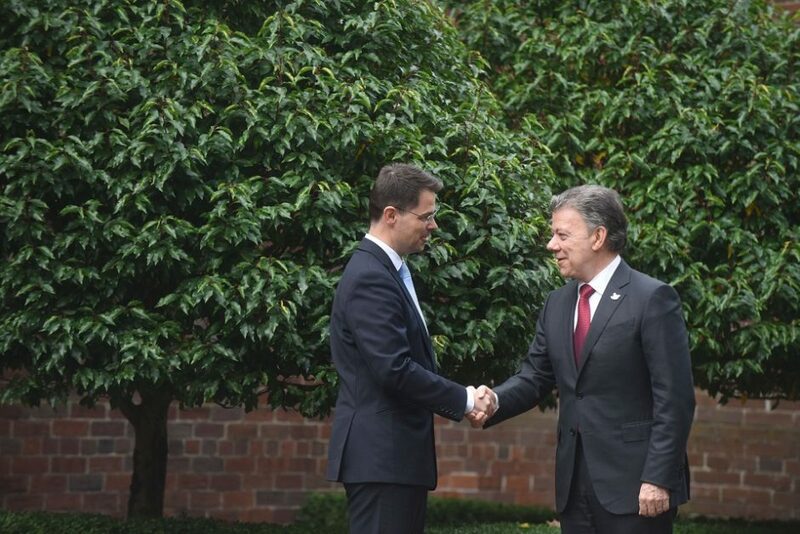 President Santos has been leading Colombia’s peace process. He heard first-hand during his meeting with the Secretary of State about the benefits that peace and political progress has brought for community relations and efforts to build a stronger economy in Northern Ireland. Full details of his programme can be found here. Northern Ireland Co-operation Overseas (NI-CO) is a not for profit, UK government-owned body dedicated to the pursuit of building efficient, accountable and sustainable public sector institutions. It will cultivate and promote long-term links between Northern Ireland and Colombia, sharing expertise on peace-building, particularly on policing reform and widening participation in education in disadvantaged communities. The Secretary of State formally welcomed President Santos at Belfast City airport on behalf of the UK government, alongside Lord Lieutenant of the County Borough of Belfast Fionnuala Jay-O’Boyle OBE.